Mibu-dera temple in central Kyoto enshrines Jizō Bosatsu, the guardian of children, and is well known for its connections to the Shinsengumi. 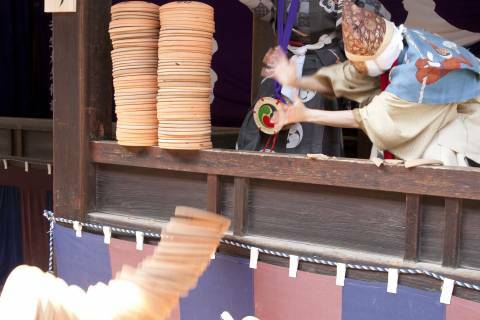 Its nickname “Temple of Plays”, however, comes from the 700-year-old tradition of religious pantomimes known as Mibu Kyōgen, performed in February, April, May, and October. Your general kyōgen came to be as shorter, more comical versions of nō plays enjoyed by the upper class samurai in the past. It served first as brief intermissions between nō plays and then as entertainment for the common folk, but the kyōgen at Mibu-dera was actually born from the efforts of Saint Engaku, who preached to crowds in 1300 at the Dainenbutsu-e ritual and led them in the invocation of Amida Buddha’s name. Looking for ways to make himself heard by the countless people who gathered for the ritual, Engaku came up with the idea of using pantomime to illustrate Buddhist morality tales, accompanied only by religious chanting so there was no need to strain to hear the actors speaking on stage. 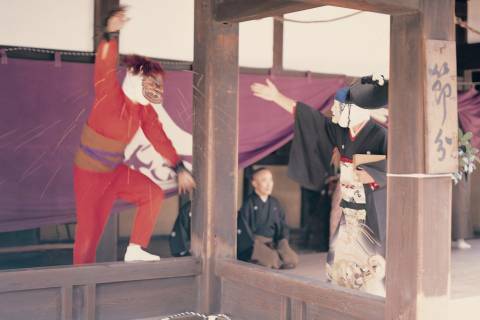 With the official name of Mibu Dainenbutsu Kyōgen and the more colloquial nickname of Mibu-san no Kandenden, the performances evolved over time into silent plays that use only bells, flutes, and drums as actors in colorful period costumes and weathered character masks perform vignettes from Buddhist parables and Japanese folk tales. At present, Mibu Kyōgen performances take place at Setsubun (in early February), in spring, and in autumn. In February, only the Setsubun-themed play is performed, but it’s free to watch! At the April-May and October performances you can pay a mere 1,000 yen to view as much as you like of five fifty minute-long plays chosen from the temple’s repertoire of about thirty (summaries detailed in full on their English website). If you are lucky, one of the plays you watch will be utilizing some of the more creative stage interaction, such as the spider demon’s explosion of thread, the Nue demon’s tightrope, or the breaking of unglazed plates for good luck! These days Mibu Kyōgen serves as popular entertainment, but at its heart it is a religious devotion offered to the temple’s principal object of worship. Amazingly, this tradition has not skipped a single year since 1300! 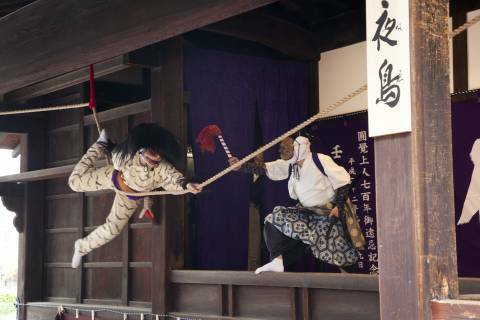 Its performances never fail to attract an audience, and in 1976, Mibu Kyōgen was designated an Important Intangible Folk Cultural Property, the first in Kyoto Prefecture.